Low Rents Don't Have to Mean Low Quality! 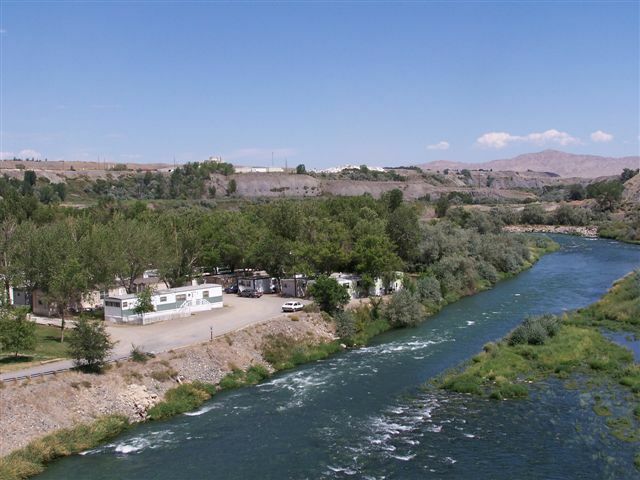 Riverfront mobile home rental lot. 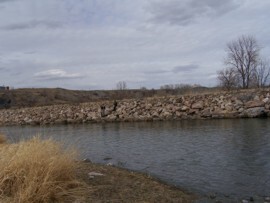 Lot #35 at north end of park overlooks Shoshone River. Highest-rated fishing. $435 per month + utilities. Will hold up to 14 X 70 home. Home must be newer and attractive. Photos required and you'll need to pass our tenant approval process. Permanent home only, no RVs. Cabin 0: 3 bedroom, 1 bath, 992 square foot log cabin. Woods and river back yard. $895 plus $500 security. Available week of May 1, 2019. LOCATION: Half mile north of Cody off Highway 120 along the north bank of the Shoshone River. Turn left on 2ABW just after crossing the Shoshone River bridge (Highway 120). 2ABW then runs you back under the bridge and into the park. MANAGEMENT: Our manager is Jodi Emigh. She lives on-site and can be reached by calling 307-587-9089. Showings are performed after you make an appointment with her. 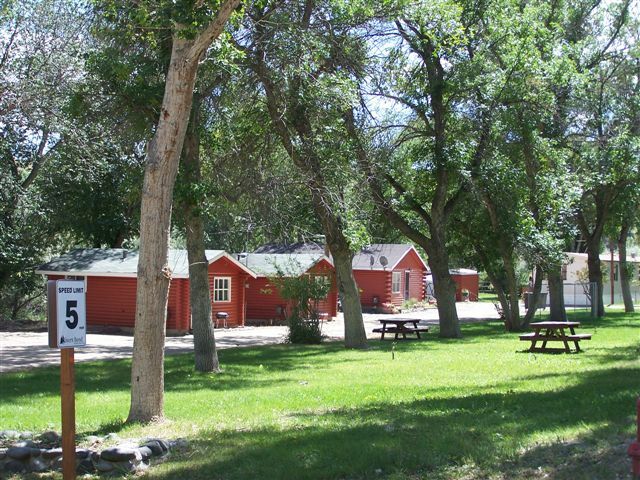 GENERAL INFO: Rivers Bend is a 36-unit community located on 5 wooded acres along the Shoshone River. 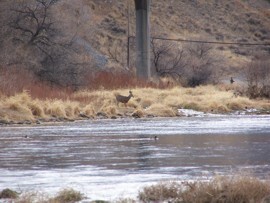 Deer graze on the property each night and the river next to the park has earned the highest rating for fishing: Blue Ribbon 5. One, two and three bedroom units are offered. The rental dwellings include 12 singlewide trailers (600-1280 square feet), 7 log cabins (280-992 square feet) and one doublewide trailer (1430 square feet). Ten tenant-owned singlewide trailers are also on the property on rented lots. The community also offers rental storage space for tenants. 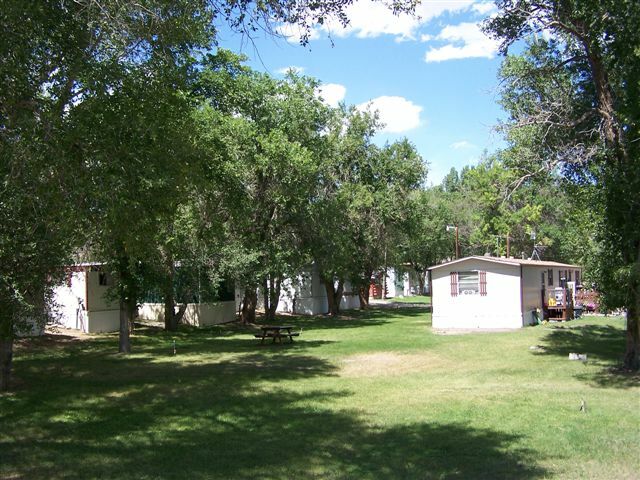 AMENITIES: Rivers Bend has laundry facilities, childrens playground, several storage buildings, large park-like common areas, multiple picnic tables and is located along the heavily-wooded Shoshone River conveniently located in north Cody city limits. Deer graze on the property daily. Tenants enjoy a five acre wooded nature trail next to Rivers Bend that provides peaceful pathways through the woods and along the river. Rivers Bend residents can also access the city's two-mile paved riverwalk trail located just across the river from the Rivers Bend community. This trail follows the other bank of the Shoshone River. Both trails provide opportunities to see deer, beavers, bald eagles and on rare occasions, moose or black bear. PETS: We love dogs and cats but unfortunately, they don't always treat our dwellings with equal love so we are selective about what pets we allow. We will consider accepting your dog if it is well-trained, does not bark, is spayed or nuetered and lives inside. This consideration is for long-time house dogs only. No puppies. We also might approve your cat if it is spayed or nuetered and stays inside. Dogs and cats require an additional $300 deposit. If you want an animal companion that does not require an additional deposit, we do allow fish, hamsters and birds. LEASE: We require a minimum of a 12-month lease. We've found that this makes our community more stable and pleasant. We do enforce the lease however, so you must fulfill the term of the lease once you sign it. In the case of rare, unexpected emergencies that require you to break the lease, we might negotiate a settlement. This type of case is extremely rare and each case is decided at our sole discretion. PRICING: Rivers Bend offers some of the lowest rents in the entire Cody area yet provides quality homes in the best rental location in Cody. Rents range from $475 - $995 per month and security deposits range $400 - $750. The average rent in the park is about $595. The average security deposit is $450. NATURAL GAS: $20-$30 per month in summer, $60-$120 per month in winter (metered based on your usage). To get natural gas in your name when you're approved as a tenant, call Black Hills Energy at 1-888-890-5554. A deposit may be required. CABLE TV / INTERNET / TELEPHONE: Rivers Bend is located in an area that offers the following Pay-TV options: Western Wireless (527-5434), DirecTV (1-888-238-7177) or the Dish Network (1-307-548-7990). Dialup, DSL and wireless Internet connections are available from VCN (587-5263) or CenturyLink (1-800-475-7526). Traditional telephone service is available from CenturyLink (1-800-475-7526) and cellular service is available from Cellular Plus (307-587-9183). APPLICATION PROCESS: We must protect our investment and the well-being of our current tenants, so not just anyone can live here. Applicants must undergo a screening process to verify they have no drug, crime or serious credit problems and will be a good neighbor to the rest of our tenants. If you are approved as a tenant, this process will make you feel secure that your new community will remain pleasant for you. The application process includes a discussion with our park manager and completing a two-page application. The application includes asking your permission to conduct a background criminal investigation, credit check and your authorization for us to speak to your past landlords and current references. This process is usually conducted within 48 hours of our receipt of your completed application. 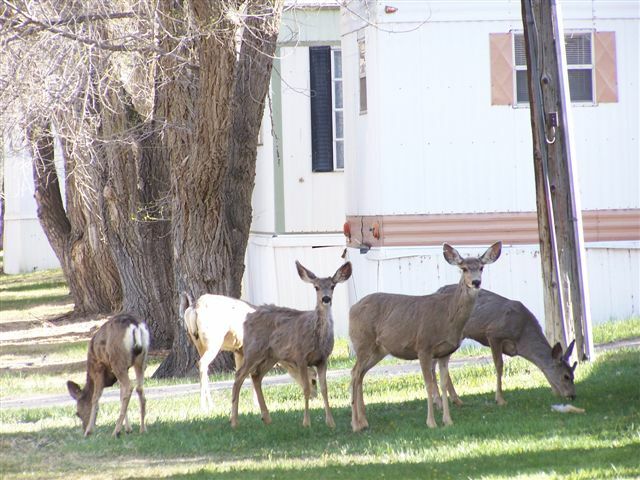 OWNERSHIP: Rivers Bend Mobile Home Park is owned by Pioneer Properties, LLC, a Wyoming limited liability company owned by area residents Mike & Margie Johnson. The Johnson's can be reached at 307-587-2331. OWNER'S PHILOSOPHY: Low rents don't have to mean low quality! Mike & Margie purchased the park in January, 2003 and have invested over $800,000 to improve the park and its dwellings' comfort and appearance. The owners have created a pleasant community that has a no-drug, crime or domestic dispute policy and has an attentive on-site manager to keep it that way. If you live in one of our rentals and have a maintenance issue, it will be repaired with a sense of urgency. We realize there are many rental choices in the marketplace so we show our appreciation to tenants by providing an affordable and constantly improving rental community. We respect you and appreciate your business! Click here to access the Cody Chamber of Commerce and learn more about Cody's demographics, climate and employers. 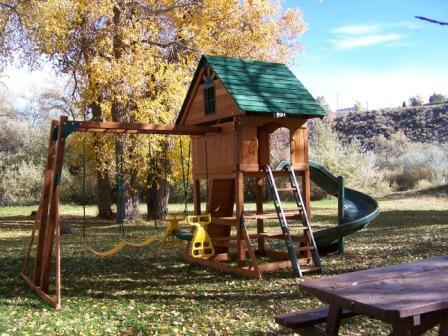 Click here to view Park County Travel Council visitor, vacation and group travel information. Click here to visit Cody Trolley Tours the best and fastest overview of Cody! Click here for a current view of downtown Cody via the Cody Chamber webcam. Click here for a live view of Yellowstone's Old Faithful geyser and access to the Yellowstone National Park website.